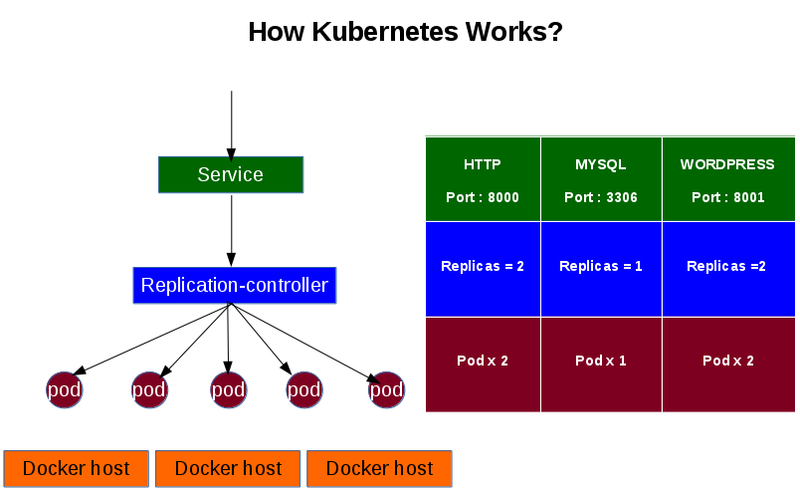 Continue with my previous post ‘Docker Infrastructure V1.1‘, I want to share some my understanding of how Kubernetes works. Pod: it is the smallest unit in Kubernetes. It contains one or more containers. Replication-controller: It controls and also guarantees the instance numbers of a pod. Service: it is interface that user or other applications can interact with. If you ever used AWS ECS, it may be easy to understand the concept. Here is how I compare them. 1) Create a replication controller and set replicas size – how many pods you want to run. Here is my sample json file. It will create 2 pods within the replication-controller my-httpd-01. 2) Create service to use the backend replication controller that is created above, and expose the port to external world. Here is the sample json file. It creates a service named my-httpd-01 to use the replication-controller my-httpd-01 that is created above, and expose the service to port 8000. External users can access it via the defined public IP addresses. When user access the HTTP service, the traffic are load balanced by the service between the pods.